Last revised 18 July 2012. 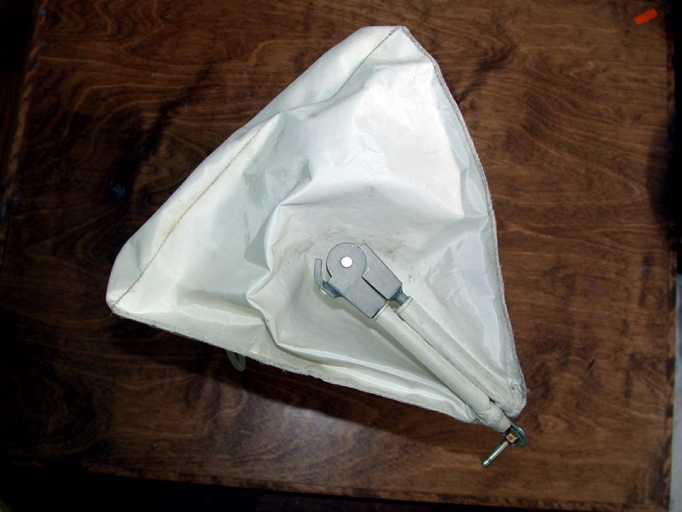 The purse was used primarily for stowage of the purge valves between the EVAs. During EVA preps, the astronauts installed the purge valves well after they were suited and, had they dropped one of the valves, retrieving it from the floor would have bene relatively difficult. 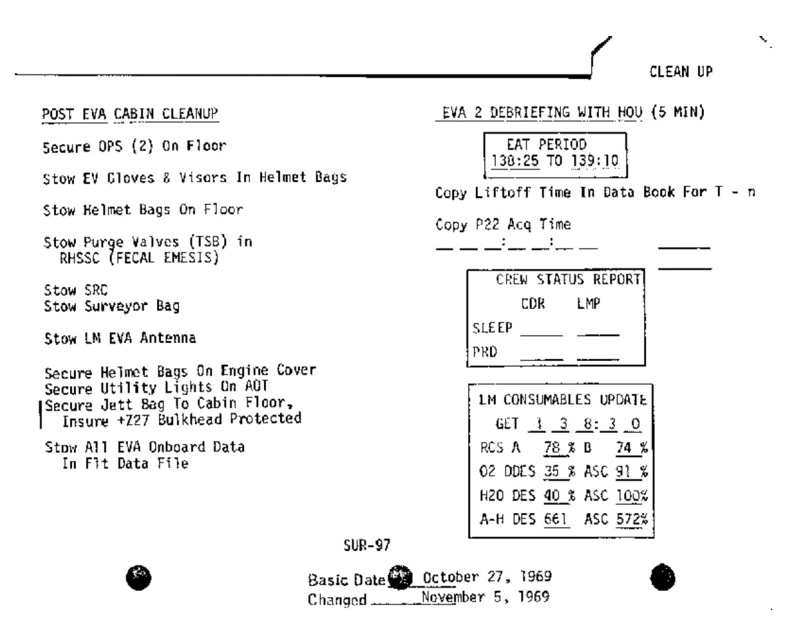 Similarly, after each of the EVAs, they took the purge valves out of their connectors soon after re-pressurizing the cabin. With the purse attached within easy reach to the front of Panel 5 at the CDR's station, it was easy to keep the purge valves out of harm's way. The purse was made out of Beta cloth; was 23 cm tall and 31 cm wide; had a snap closure like some styles of ladies's handbags; and two pins for fastening it to the front of Panel 5. The flown Apollo 12 purse is now in Alan Bean's collection. He and Ulli Lotzmann have produced a detailed set of photos. 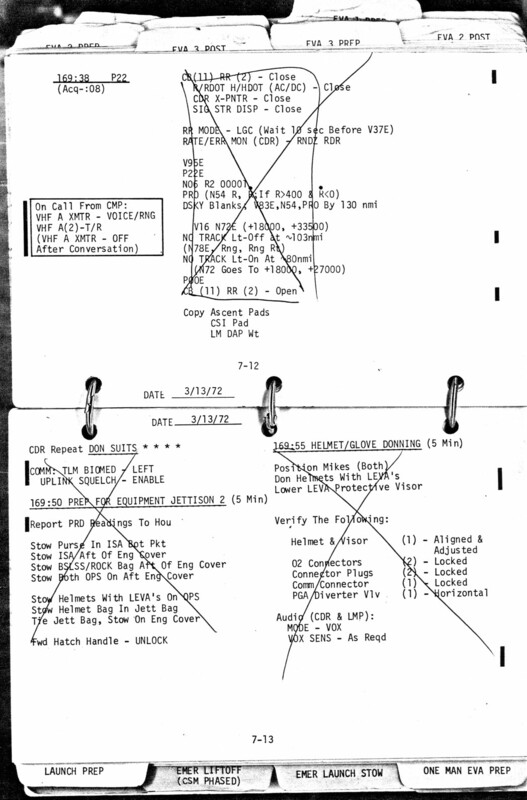 For unknown reasons, the purse was named for the Apollo 9 Commander, Jim McDivitt. 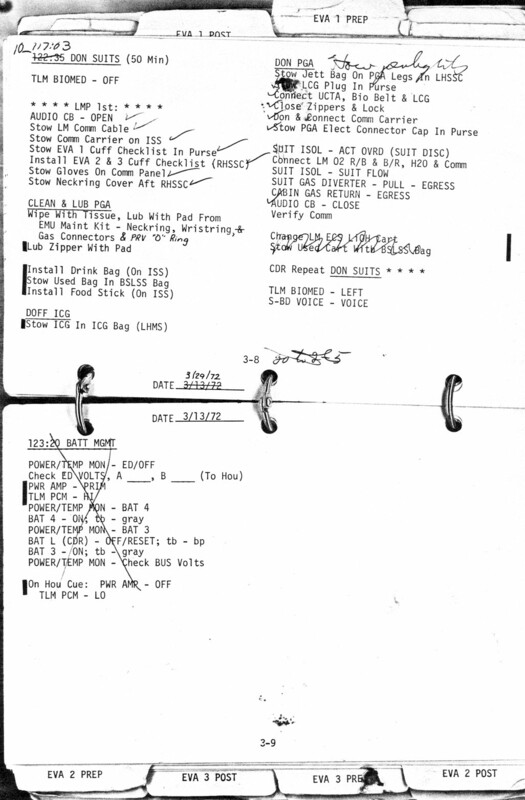 Because his crew was first to fly the LM, it is possible that the purse was devised for that flight. The purse served its intended purpose well. The purse was mounted far enough left that it couldn't interfere with opening and closing the hatch. However, on a few occasions it got in the way of the Commander as he got into position to crawl backwards out the hatch, but the LMP had no trouble lifting it out of the way or directing the Commander how to move so the purse would no longer be in the way. 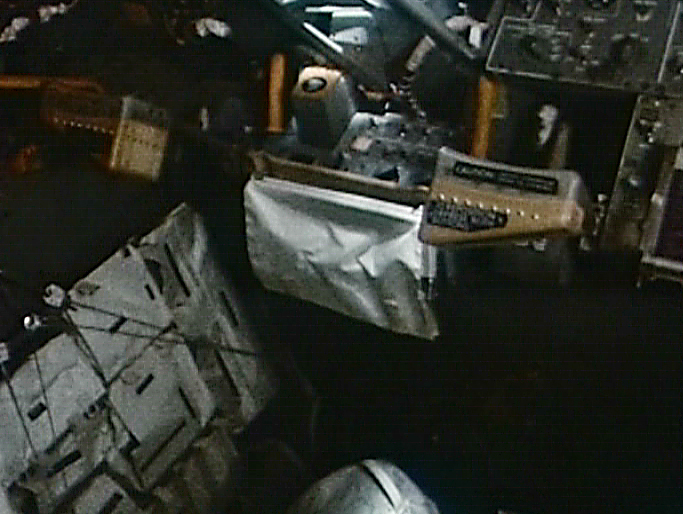 The Apollo 17 purse shown hanging under the CDR station in the LM. 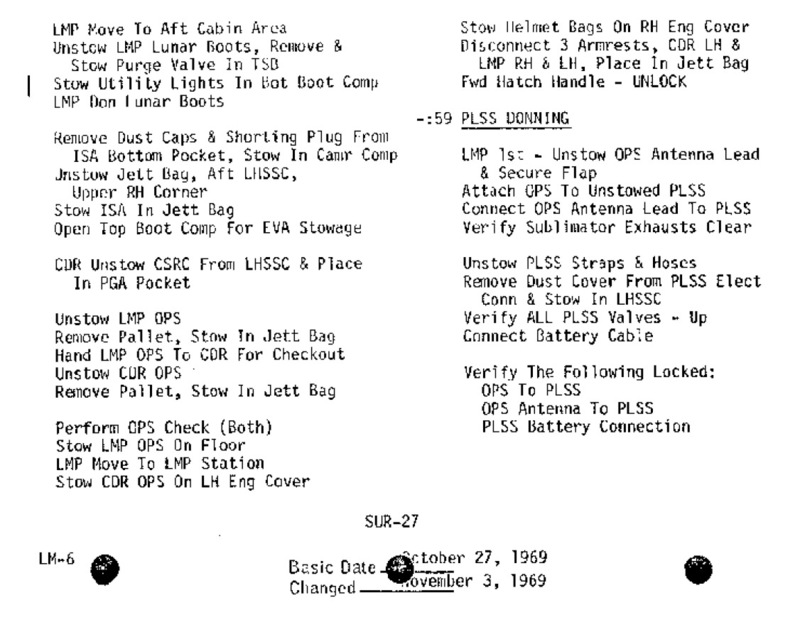 Apollo 13 purse containing a DAC with side-mounted battery pack. 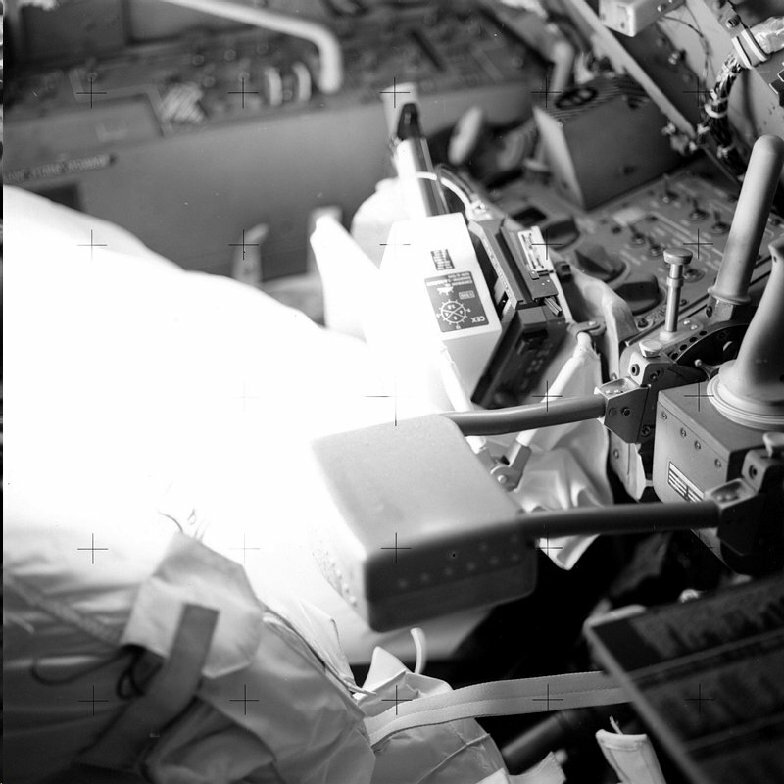 Side view of the flown Apollo 12 purse with the bottom fully open at top left. The opening is at lower right. Neil took his picture of Buzz with the purse during the initial LM inspection. In order to get into position, the CDR stands facing the back, outside corner of his station on the left side of the cabin and gets himself as close to kneeling as he can. He moves his feet toward the hatch and, as he gets room, moves to his left toward the centerline of the cabin and bends his torso , eventually getting on hands and knees. Here, Buzz tells him "Your back is up against the purse. Forward and up (toward the back of the cabin and getting his back more vertical); now you are clear." "Remove TSB (Temprary Stowage Bag) from bottom pocket ISA (Interim Stowage Assembly). position on Panel 5." 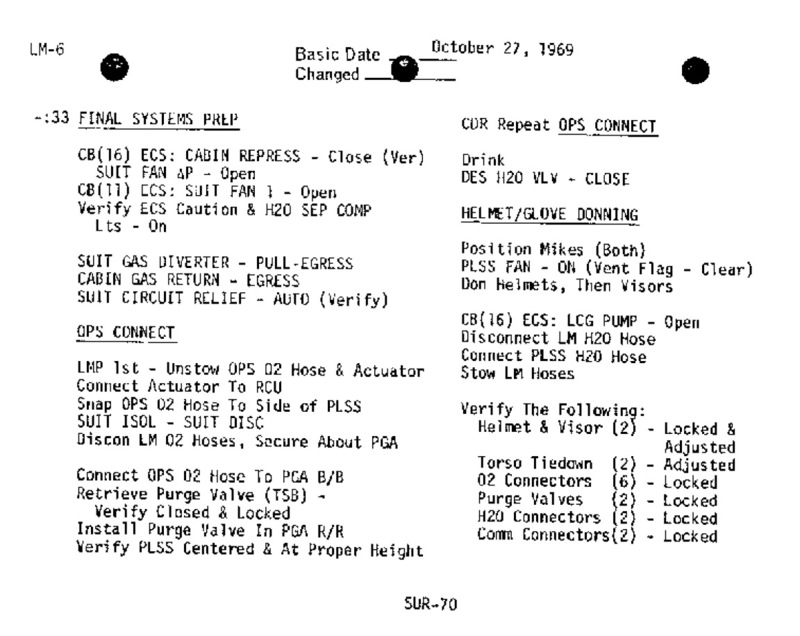 Later on that same page, they "unstow CDR Lunar Boots, remove and stow purge valve in TSB". On Sur-27, they do the same for Al's boots and purge valve. 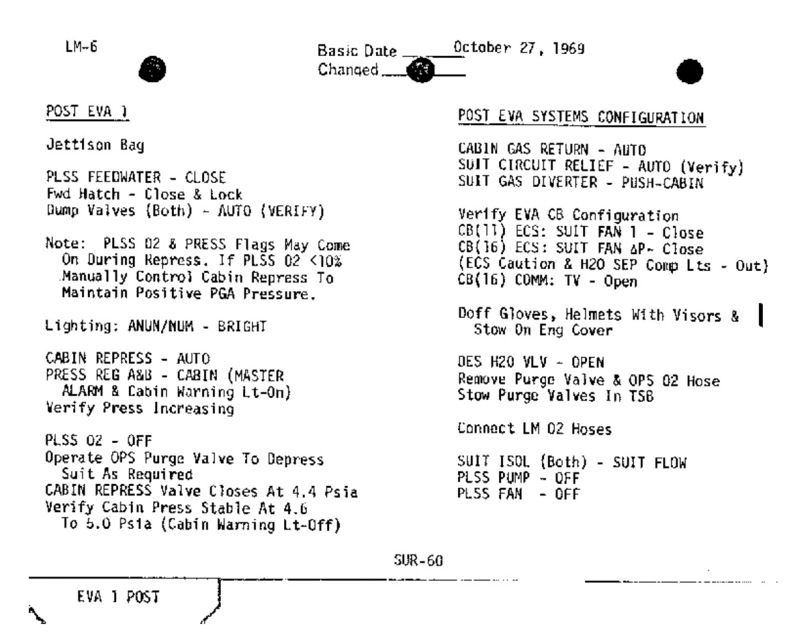 The Apollo 12 stowage list confirms that the purge valves had traveled out from Earth stowed in the lunar boots. They install the purge valves starting at 114:36:01. Al tells Pete he's bumping into the "McDivitt Purse." Pete doesn't know it by that name. The purse was a white, cloth bag that was up there under the computer DSKY that we just threw loose items in. In fact, I've still got it at home. It had a snap (closure) and you opened it up and threw stuff in and closed it. That's why we called it a purse. It was also shaped like a purse. It was made out of beta cloth. That's what Pete was hung up on, and I probably just lifted it up so that he could get out. After doffing helmets and gloves, they remove the purge valves and stow them in the TSB. Pete gets the purge valves out of the TSB for installation. As per Sur-92, after they get the cabin pressurized and the suits deflated, they put the purge valves in the TSB. Al apparently tries to toss his in, but misses. After the final jettison, as per they put the TSB in a now-empty stowage slot on Al's side of the cabin. 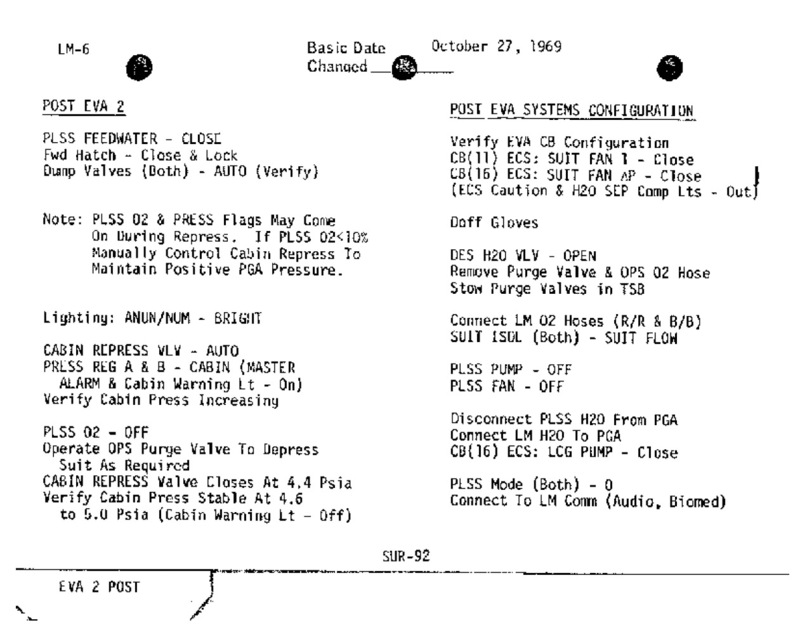 They are taking the purge valves back to orbit in case they need to do an EVA transfer to the CM using the OPSs. Mitchell: "You're hung up on the purse. There you go." In preparation for suit donning "Stow PGA (Pressure Garment Assembly) Gas Conn Plugs in Purse. Empty PGA Pockets into Purse" and, a few lines later, "Purge Valve to Purse". In the righthand column, "Stow EMU Maintenance Kit is Purse." There is also an indication that the antifog treatment for the bubble helmets is in the purse, perhaps having been in a PGA pocket. "Remove Elect Dust Cap, Stow in Purse" After the EVA, these are retrieved from the purse and re-installed. Irwin: I took it down, Dave. I thought that was one of the things that I was hanging up on. These are probably protective bags for the film magazines which, apparently, were stowed in the purse. 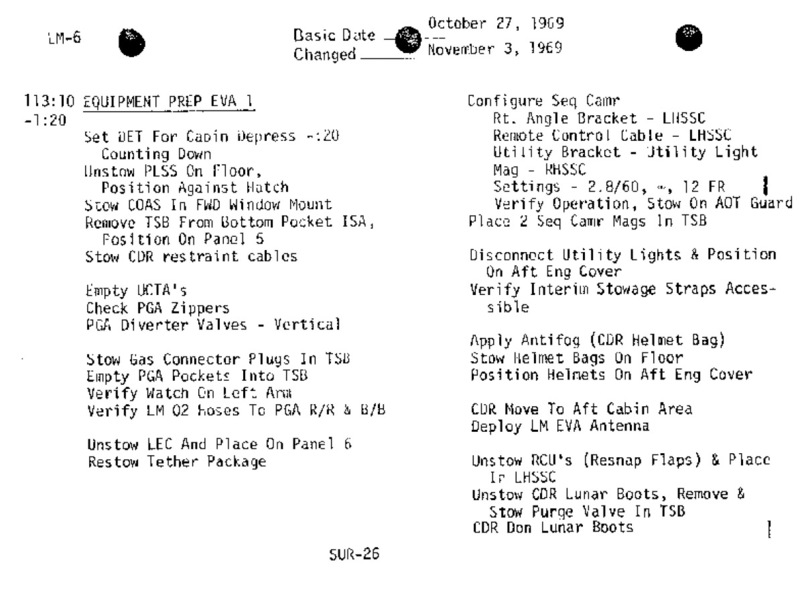 They are probably the bags listed for transfer from the CM to LM on page 75 in the Apollo 15 Stowage list. They've almost certainly just fallen out when Dave retrieved the purse. Jim put it "behind" Dave, possibly on the midstep. Becasue the purge valves are quite dirty, Dave decides that they should take out of the purse any items that are currently clean and stow them somewhere where they can stay clean. Dave comments that there ought to be a purse for items that need to stay clean and one for dirty items. 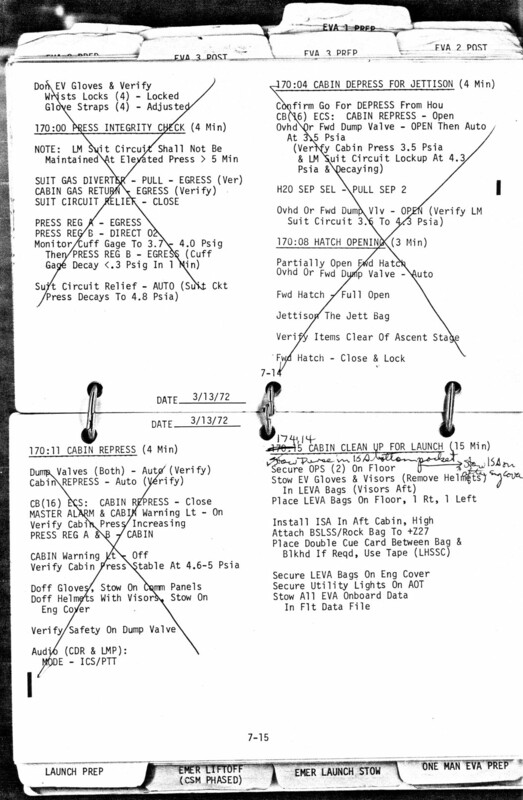 During suit donning, John and Charlie stow the cuff checklists, LCG (Liquid Cooled Garment) plugs, and the PGA electrical connector caps in the purse as per page 3-8 in the LM Lunar Surface Checklist. John needs the flashlight while trying to get his PLSS stowed on the wall behind his station. Charlie tells him it's in the purse. Schmitt: "Push. There you go. (Pause) Keep your buttons close (to the floor). You're good. (Pause) Beautiful. Just float in. Hanging up a little on the purse, but that's all right. There you go. Schmitt: "You need to go to your left a little to clear the purse and your (tool) harness. There we go."